In this post, we take a look at how you can implement a HATEOAS-based RESTful service using Spring Boot. If this sounds interesting, read on for the details! This guide will help you implement HATEOAS for a REST API/Service with Spring Boot. Why do you need HATEOAS? How do you implement HATEOAS with Spring Boot? What are the HATEOAS best practices? 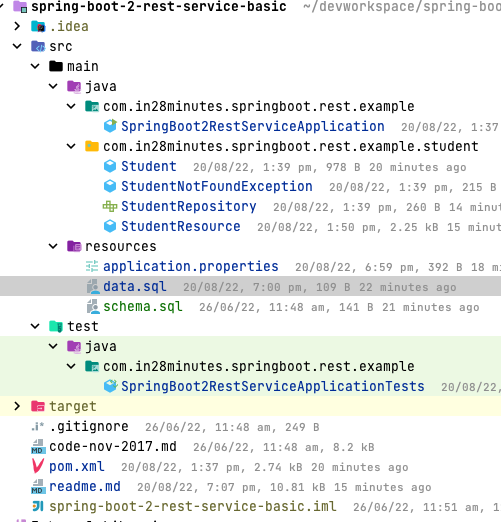 SpringBoot2RestServiceApplication.java - The Spring Boot Application class generated with Spring Initializer. This class acts as the launching point for the application. Richardson Maturity Model defines the maturity level of a Restful Web Service. Following are the different levels and their characteristics. Level 0: Expose SOAP web services in REST style. Expose action based services (http://server/getPosts, http://server/deletePosts, http://server/doThis, http://server/doThat etc) using REST. Level 1: Expose Resources with proper URI’s (using nouns). Ex: http://server/accounts, http://server/accounts/10. However, HTTP Methods are not used. Level 2: Resources use proper URI’s + HTTP Methods. For example, to update an account, you do a PUT. To create an account, you do a POST. Uri’s look like posts/1/comments/5 and accounts/1/friends/1. Level 3: HATEOAS (Hypermedia as the engine of application state). You will tell not only about the information being requested but also about the next possible actions that the service consumer can do. When requesting information about a Facebook user, a REST service can return user details along with information about how to get his recent posts, how to get his recent comments and how to retrieve his friend’s list. HATEOAS stands for “Hypermedia as the engine of application state.” It's a complicated acronym. Let’s decode it for you. What do you see when you visit a web page? The data that you would want to see. Is that all? You would also see links and buttons to see related data. HATEOAS brings the same concepts to RESTful Web Services. Links to retrieve his friend’s list. In the previous article in the series, we set up a simple RESTful service with a resource exposing CRUD methods. We will use the same example to discuss HATEOAS. Listed below are some of the important dependencies from spring-boot-starter-hateoas. The most important dependency is spring-hateoas. To implement HATEOAS, we would need to include related resources in the response. Instead of Student, we use a return type of Resource<Student>. Resource is a simple class wrapping a domain object and allows adding links to it. We create a new resource. We add the link to retrieve all students method to the links. You can see that there is a new section _links with a link to all students Resource. Above example covers important concepts in enhancing resources with HATEOAS. What are the important resources related to a specific resource? Go ahead and enhance the application with more HATEOAS links. Published at DZone with permission of Ranga Rao Karanam . See the original article here.